I’ve briefly mentioned Nelson Mandela and his extraordinary life before, like in Cape Town with Kids: Robben Island and A Trip Back into South Africa’s History. But I haven’t dedicated an entire post just to him, which is way overdue. I was going to do so when I finish A Long Walk to Freedom but unfortunately this is also proving to be “A Long Slug to the Last Page” for me, so his birthday arrived first to force my hand. To be honest, when we first set foot in South Africa, I didn’t even know Nelson Mandela was still alive. I’d always been interested in the history of South Africa and probably knew more about it than the average American (admittedly my knowledge was gained not by poring over historical records but rather inhaling books such as The Power of One) but still, that whole transition from apartheid to democracy was always a bit fuzzy to me. What I’ve learned since then, more than anything else, is that Nelson Mandela is beloved to all South Africans. Black, colored, Indian, white, whatever you may call yourself, if you live in South Africa, you idolize Nelson Mandela. 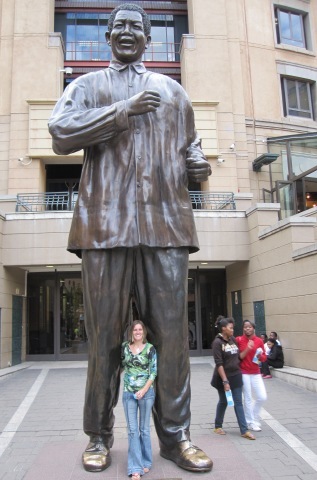 His large bronze statue on Mandela Square is probably one of the most-photographed attractions in Johannesburg. The best way to understand this love is to watch the movie Invictus, if you haven’t seen it yet. Today – July 18th – South African school kids of every color and background will dedicate volunteer and outreach activities to the spirit of Nelson Mandela’s message, and all of South Africa will once again stop and think about his huge accomplishments to ensure a peaceful transition to democracy, at a time when this was far from being assured. His insistence on reconciliation and forgiveness – an almost superhuman feat if you consider his 27 years behind bars – was instrumental in saving South Africa from civil war in the early 1990s. Sure, others had a hand in it as well, namely Frederik Willem de Klerk, who shared the 1993 Nobel Peace Prize with him for their joint and tireless work towards peace. But more so than anyone else, I can thank Nelson Mandela for the chance of even living in South Africa today.